I bet many of you have been singing this fun silly song for many years. I know I have. It’s such a good reminder that Abraham was a father and must have experienced joys and hardships like all of our dads. 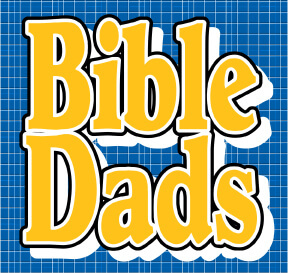 This week’s Bible activity for kids will hopefully introduce some other Bible dads to your elementary kids through riddles and clues. 1. Below this article, I have provided you with 50 clue cards that showcase 10 different dads in the Bible. Prepare these clues on colorful cards and laminate them for long term use. 2. You will need a die with the typical numbers of 1 – 6. I actually made one from a cardboard box. The size is about 9″ x 9″. The kids love it because it’s big and colorful and fun. 3. You will need 10 envelopes to place each of the clue cards into. Number each of the envelopes on the outside to correspond with the number of the Bible Dad being guessed. Each envelope will contain 5 clue cards. You should now have 5 clue cards for each Bible Dad. Place all 10 envelopes on a table or a pocket chart so that the kids can easily see them. Divide your class into two teams. Decide which team will go first and let them pick the first envelope of clues to be guessed at. A child from the first team will roll the die. If they roll a 1, 2, 3, 4, or 5, they will choose the clue card with the number that corresponds. You will read the clue card and see if the child can guess which Bible Dad it describes. If they guess correctly, they earn 10 points for Clue 1, 20 points for Clue 2, 30 points for Clue 3, 40 points for Clue 4, and 50 points for Clue 5. The clues range in difficulty from Clue 5 being the hardest and Clue 1 being the easiest. If the child guesses incorrectly, that clue card is no longer used and set to the side and the next team is up. If a child rolls a number that has already been picked, the next team is up. If a child rolls the number six, the child can pick any clue he wants. Once a Bible Dad has been figured out, place the next set of Clue cards on the chart to be played with. If a Bible Dad is never figured out, simply take down that set of cards and continue with a new Dad. Play the game as long as the interest is high. Clue One: My wife laughed when she found she was going to have a baby at such an old age. Who am I? Clue Two: I am the father of Ishmael and Isaac. Who am I? Clue Three: God promised me that my descendants would be as many as there are stares in the sky. Who am I? Clue Four: God gave me the greatest test of my life when he asked me to sacrifice my son. Who am I? Clue Five: I should not have listened to my wife when she asked me to have a child with our maidservant. Who am I? Clue One: I cheated my brother out of his birthright. Who am I? Clue Two: My second to youngest son was sold into slavery by his brothers. Who am I? Clue Three: I had twelve sons who became the twelve tribes of Israel. Who am I? Clue Four: I had two wives who were sisters. I loved one more than the other. Who am I? Clue Five: I wrestled with God and He changed my name to Israel. Who am I? Clue One: I was my father’s favorite child. He proved it by giving me a special coat. Who am I? Clue Two: My brothers sold me into slavery when I was a young boy. Who am I? Clue Three: I was the second youngest of twelve sons. Who am I? Clue Four: I had an Egyptian wife and became the father of two sons. Who am I? Clue Five: I was the second youngest of twelve sons. Who am I? Clue One: I killed a Philistine giant with my slingshot and just one stone. Who am I? Clue Two: I was the king’s harp player and wrote many songs about God. Who am I? Clue Three: I was the youngest of eight sons and helped tend my father’s sheep. Who am I? Clue Four: My best friend was Jonathan. Who am I? Clue Five: I became the father of Solomon who would later become king. Who am I? Clue One: My first home was a garden. Who am I? Clue Two: I was the first man to become a father. Who am I? Clue Three: My father is God. Who am I? Clue Four: My first son murdered his brother. Who am I? Clue Five: I enjoyed perfect fellowship with God for a time. Who am I? Clue One: One of my sons tricked me into thinking he was his brother and so received my best blessing. Who am I? Clue Two: I became the father of twin boys. Who am I? Clue Three: My wife was chosen for me by God because she watered my servant’s camels. Who am I? Clue Four: My father became “the father of many nations.” Who am I? Clue Five: It was promised that my brother and I would become great nations. Who am I? Clue One: My wife gave birth to our Lord and Savior. Who am I? Clue Two: Some very wise men came to visit my wife and I after she gave birth. Who am I? Clue Three: I was a carpenter by trade. Who am I? Clue Four: I wanted to quietly divorce my wife. Who am I? Clue Five: My wife and I became very worried one day when we could not find our son. Who am I? Clue One: My son would prepare the way for the Lord. Who am I? Clue Two: An angel came to me in the temple and told me that I would be the father of a very great man. Who am I? Clue Three: Because I did not believe the angel, I became silent until my son was born. Who am I? Clue Four: I was a priest in the Lord’s temple. Who am I? Clue Five: I was a very old man when I became a father for the first time. Who am I? Clue One: I had a best friend named David. Who am I? Clue Two: I had to protect David from my father’s cruel feelings toward him. Who am I? Clue Three: My father was the first king of Israel. Who am? Clue Four: My good friend David took care of my son after I died. Who am I? Clue Five: I had a son who had a handicap. His name was Mephibosheth. Who am I? Clue One: I was the father of two girls, Leah and Rachel. Who am I? Clue Two: I tricked my son-in-law on his wedding day. Who am I? Clue Three: I tried to trich my son-in-law out of some sheep. Who am I? Clue Four: I was Rebekah’s brother. Who am I? Clue Five: I became the father-in-law to Jacob. Who am I? Just to let you know your quizzes are NOT JUST FOR KIDS! I am making a PowerPoint quiz using your Who Am I ? Father’s Day quiz. for my women’s Sunday School Class. Thanks! Awesome! So glad that you are using these games for adults, too! Blessings!